In Part 1 of this series, we looked at why it’s important to prioritize pleasure and how to actually bring more of it into your life. 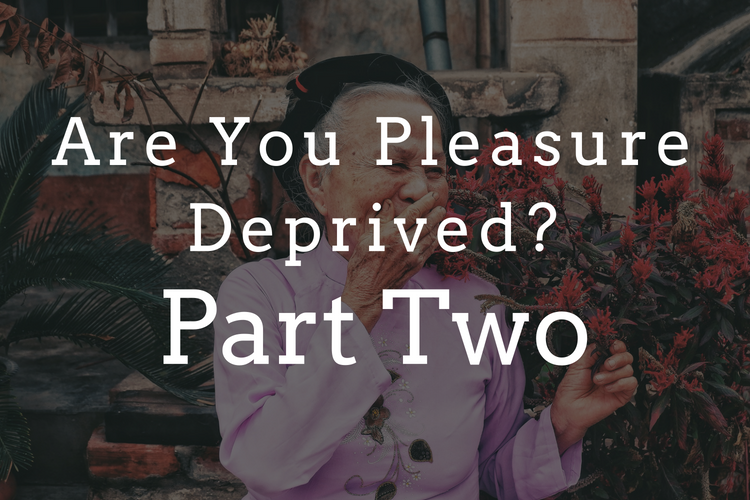 Now in Part 2, we explore the common obstacles to prioritizing pleasure and how to get the most of your pleasurable events. In our San Francisco therapy practice, we see people struggling to do nice things for themselves. Here are the reasons we see cropping up most often and how we encourage people to participate in pleasurable activities. Focusing on avoiding potentially painful emotions may prevent you from doing the things that can help you feel more positive emotions. For example, if dancing brings you joy but you focus on the fear that others will judge you for how you look, you may never make it onto the dance floor. You miss an opportunity to feel pleasure because you’re busy trying to avoid potential pain. We don’t get to selectively shut down some emotions and not others. Overly focusing on avoiding painful emotions will result in a numbing or shutting down of all emotions. Our capacity for pleasure and joy is in part based on our willingness to feel all emotions, including the ones that hurt. Let go of thinking in terms of deserving/not deserving pleasure. It’s not effective and it’s too subjective. If you wait for to feel like you “deserve” joy or pleasure, you are depriving yourself of good feelings right now. If your mood is low or you’re feeling depressed, it may not feel worth the effort to do nice things for yourself. You may feel too tired, overworked or overwhelmed to schedule something pleasurable into your day. You may think it won’t make a difference in how you feel. Doing pleasurable events won’t radically change your life overnight. If you’re in a deep depression, it’s not a magical pill. But over time, doing small things for yourself consistently that help you feel alive and connected to yourself and the world will improve your sense of wellbeing. Do at least one pleasant thing a day that prompts emotions such as enjoyment, pleasure, serenity, calmness, love, joy, connectedness or self-confidence. Watch out for resistance when the time comes to do your planned activity and encourage yourself to avoid avoiding. If you do something pleasant, like take a walk on the beach but you’re worried about your relationship the whole time, it won’t have much effect on your emotions. To reap the benefit of the positive experience, you have to actually experience it. You have to be present to it. So pay attention! If you’re in the habit of avoiding your emotional experiences and checking out, this will be a challenge but it’s worth trying. It’s the difference between sipping your favorite coffee or tea and reading the news on your phone versus really just being with the drink – the warmth, the smell, the taste, the whole experience of it engaging your senses. If you’re emotionally upset, refocus your attention when your mind starts to wander away from the experience. For example, if you are angry at someone and ruminating about how badly the person treated you, it’s really hard to pay attention to the delicious meal you are sharing with a good friend. Watch out for boredom. Boredom is often the result of watching events rather than participating in them. For example, you go to a party you were looking forward to but once you’re there you sit back and watch everyone else talk and laugh and have fun and instead focus on feeling self-conscious. Some people even have a fear or phobia of positive emotions and worry that if they feel good, bad things will happen. So then this is a muscle to gently work to increase your ability to stay with the good feelings. Need help to get yourself past the common obstacles to doing nice things for yourself? And bringing more pleasure into your life? Contact us at our San Francisco counseling practice 415-310-5142 to see how therapy can help you feel better more often. We offer individual therapy, couples counseling and DBT.